We asked you for Melissa Harris-Perry questions, the Jezebel readers responded and so did the host of MSNBC's Melissa Harris-Perry show. And the Tulane Professor gave us a bunch of goodies so, without further ado, here are Dr. Harris-Perry's answers! fauxrarri: How do you think the GOP will try to reach out to women in 2016? Do you see any potential GOP candidate who could pull some of the female vote against Hillary? Thanks for all you do to help educate people about politics! 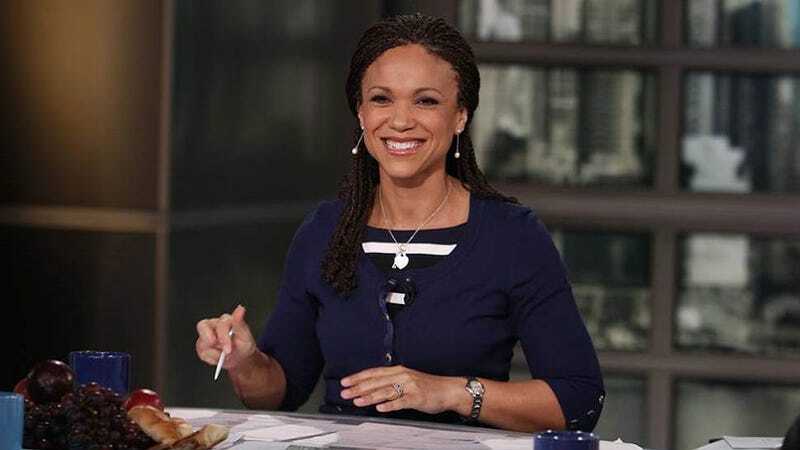 Melissa Harris-Perry: I believe that at least one member of the GOP ticket in 2016 will be a Republican woman. It is still quite early, so my best guess is that a woman will be the Vice Presidential nominee, but it is a possible a woman could claim the top spot on the ticket. Remember that in contemporary America we only elect governors, senators, and Vice Presidents to the Oval Office. Republicans have a deeper bench of women candidates in these roles, especially governor. I've been watching both Nikki Haley of South Carolina and Susanna Martinez of New Mexico quite closely. Both of these women have real potential at the national level. But your second question is crucial. If either of these women ran, could they diminish the share of women's votes earned by former Secretary of State Hillary Clinton if she were at the top of the Democratic ticket? Yes. News of a massive gender gap benefitting Democrats is overstated. Governor Mitt Romney won a majority of white women, older women, and married women voters. President Obama only enjoyed a gender gap because of women of color, younger, and unmarried women. If those voters are not motivated to turnout by a Clinton candidacy and other groups of women are energized by a conservative woman on the GOP ticket, it could seriously reduce the gender advantage enjoyed by Democrats in recent election cycles. MHP: This is really tough. I don't think there is any one lesson we teach our children about anything, especially an issue as difficult and complicated as race. I don't think I can boil it down to any one lesson. Also, I have no idea yet if I'm parenting well on the issue of race. I adore my girls, but my oldest is still just 12 and the youngest still an infant, so we don't yet know how well or poorly I'm imparting racial lessons. I might be utterly screwing up, but we won't know for sure for at least another decade. So with those caveats, I think I can summarize what I'm trying to impart with two lessons: Be open to individuals and suspicious of institutions. Be optimistic for our future and educated about our history. I want my kids to have a big messy diverse multiracial circle of friends. I want them to love, work with, learn from, and befriend people from a wide variety of backgrounds. I hope they approach each person they encounter with an initial belief that friendship, or at least tolerance, is possible and likely. But I also want them to be suspicious of institutions. I want them to understand the troubling practices of the economy, political structure, criminal justice system and other structures that reproduce inequality. I want them to be savvy enough to see those practices, smart enough to name them for what they are, and brave enough to struggle against them. I'm an American optimist. There are many reasons why, but more than anything else, I'm simply a chauvinist. This is my country, bought and paid for by the sacrifices of my family and my community as much as anyone else's. I have to be optimistic because this is all I've got and I feel a right to lay claim to it. I want my girls to also feel optimistic, to believe that we can be better than we are today, and to feel motivated to work toward that future. But I'm also a realist about how ugly our history is, how unacknowledged it remains, and how unsteady and contingent our national progress is. I hope I'm managing to convey this same lesson to my kids. I refer to this theory as my as my James Weldon Johnson approach. The second verse of "Lift Every Voice and Sing" captures this. Oh yeah and maybe a third lesson... leave your hands on the steering wheel during a traffic stop. ajiax3: Do you feel that the current state of black feminism is a dying revolution? Do you see the black feminism America once experienced in the 60s and 70s as making a comeback within the college infrastructure given the many racial and sexist issues that are starting to surface? MHP: I do not believe black feminism is dying. I also would not describe it as a revolution. It seems to me that we use the language of revolution too lightly in contemporary America. There is no single black feminist movement, with identifiable goals, structure, leaders and strategy. Although there are individual revolutionaries who identify as black feminists, I don't see black feminists, as a group, offering a clear alternative to America's existing forms of representative democracy or capitalism. And for the most part, black feminists are not armed for violent revolution or organizing wholesale direct resistance to America's governing regime through nonviolent action either. I don't mean these observations as criticisms. Black feminism does not have to be a revolution in order to be valuable and meaningful. I experience feminism as a critique, an approach, a lens and a guide for understanding and navigating the political, social, and cultural world. For me, feminism is a question: what truths are missing here? The feminist thinker and organizer should always be asking this question. What are we missing? Who are we excluding? How is our analysis true, but still limited by missing truths? For me this means feminism creates a posture of intellectual humility and a willingness to question ourselves as much as we question systems of oppression. I am always distraught to encounter feminists who are utterly sure of themselves and never willing to admit to their own need to grow, expand and change. That strikes me as inherently anti-feminist. As for college campuses, I see black feminism alive and well among individual students. But the institutional supports that allow that feminism to grow and evolve are under attack as many schools are dismantling their gender studies, ethnic studies, and race studies curricula and departments. youngscholar: What advice do you have for women starting their academic career? Looking back, is there anything you wish you had known when starting as an assistant professor? 1. Ask for resources. If they say no, ask again. Broadly speaking, as a junior faculty member, universities can offer you three kinds of resources: salary, time, and research assistance (money or student labor). It is rare to be in a position to receive plenty of all three. But it's also ridiculous for a university to claim it can offer you only a pittance of each of these. Before you accept the first job, ask for all three: a fair starting salary, clear and confirmed leave time, and robust research assistance. They won't say yes to all three, but keep pushing until you get at least one. If the college has a right budget, it can still offer you a semester of leave before tenure review. If it needs you teaching every semester, it can offer a student assistant to help collect research for your book. If it has no grad students and needs your teaching, it can offer you a decent salary. Ask. Ask. Ask. Ask. And if you are contingent faculty who are paid a pittance and have no security, it's time to join the movement to unionize adjuncts. Actually, if you are tenure track you should also join the movement to support contingent faculty members in their efforts to secure fair labor practices. Organize, organize, organize. 2. Find one student in every class that makes teaching worth it, and teach that student. All of us have had the experience of working ourselves into the ground to prepare lectures, innovate new classroom experiences, grade papers swiftly, and to be available for meetings and mentoring only to be met with yawn, disinterest, and sometimes open contempt by some of our students. This seems to be especially true of young women faculty members and it can be painful. My strategy is to find the one student in class who is engaged, completing the assignments, and fully committed to the class. This is not always the best performing student. This is not even always the student who agrees with you as a professor. Some of my most engaged students are those who come ready to do battle with my claims each week. But I find that student and think about him or her as I lecture, lead class discussion, grade and prep. Sometimes my sense of responsibility to that one student can create truly fulfilling teaching in a semester that starts out rough. 3. Get to know your chair, your Dean, and all the people whose research has nothing to do with yours. This is going to sound like dating advice, and it kind of is ... ask your departmental chair for a standing monthly lunch meeting. Tell her about what you are working on but more importantly, ask her about her research. Administrators rarely get to talk about their research because they are always managing administrative tasks. It is a sure way to build a relationship. Similarly, have coffee with your Dean once a month. Share your accomplishments and find out what major university projects the Dean is leading. Finally, make time to meet all the colleagues whose work is vastly different from your own. As a junior American politics prof, I got to know the political theorists in my department quite well. It dramatically changed the kinds of books I read, the questions I ask, and how I approach my research. Getting to know the administration and your colleagues is good strategy, but more importantly, it is good intellectual practice. 4. Ignore the advice to avoid committee work. I hate this advice. Senior people give it to junior people all the time, but it is bad advice. Serve on committees, learn how the university works, and build relationships in your field beyond your university and in your university beyond your department. The advice to keep your head down and focus exclusively on publication presumes the academy is mostly about merit. It is only partly about merit. It is also about reputation and relationships. Don't be afraid to invest in building those relationships just because they don't "count" and can't be listed on your CV. But only do the committee work you find valuable and meaningful. Don't say yes to everything; say yes to what matters to you. 5. You are their colleagues, not their daughter or their date. Be smart, not nice. I am not very nice. I think if you talked to any of my colleagues or coworkers they would tell you the same thing. In fact, I'm a pretty hard person to have on your faculty, because I am a bit of a rule breaker. But I think it is very important for junior women to be comfortable with not having to be nice. It is far more important to be smart. I am not suggesting you be mean or awful, but nice is overrated. Be an extremely hard worker. Be honest. Be fiercely loyal. Be willing to admit mistakes and learn. Be open to other people's ideas and perspectives. But forget being nice. Speak up in meetings. Disagree openly and respectfully. Have the best prepared argument in the room. You want your senior colleagues to perceive you as formidable, not comfortable. 6. Keep friends, real friends. Call them and complain every day. Our job is so sedentary. Walk every day. Drink a ridiculous amount of water and just a little less coffee. Cancel class if you are sick. 8. Don't be afraid to fail. Aim for tenure, but know that being denied tenure is not an accurate assessment of your human value. Submit to the best journals, but if you never land a piece, don't take it as an assessment of your inherent worthiness. The academy is a lifetime of rejection and criticism. You will always write work that some people hate, teach classes that some students despise, and serve on some committees that accomplish nothing. But then you will touch other students and change their lives, you'll start or save an institution or program that persists long after you're gone, and you eventually write the book or article or research finding that makes a meaningful contribution. I promise. Don't be afraid of the hard parts and failures. hulahoop321: Hello! I would LOVE to know what books are on your must-read list. Here is the Black Feminism syllabus we put together on the MHP show and the syllabi from the past seven courses I've taught. barackalypsemeow: Hi Melissa, As a parent of an adopted child [CJ, 4yrs old] who is mixed race [Chinese-Japanese], what is the best way to make him/her feel comfortable within our large, ostensibly "white" household? Our other children are 17, 15, and 12 and each one, at one time or another, has expressed concern that we adopted our little CJ kind of out of nowhere. I want this family to mesh with CJ and more than anything, set a good example for our neighbors and friends. MHP: My first thought is to remember that children respond to love and acceptance. I come from a very racially diverse family. We are diverse through intermarriage rather than adoption, but there are children of different racial backgrounds in multiple generations. The first rule we follow is simply that we are family. Full stop. We fight. We love. We share. We ignore. Normal family stuff. So I would encourage you to not begin with the assumption that CJ will necessarily feel bad about his experiences in your family. But I've learned from talking with transracial adoption families that love is critical and important, but not enough. There are complicated issues of identity, culture, and belonging that sensitive parents must deal with, not ignore. It sounds to me like you are a sensitive and proactive parent. We had an amazing guest on the MHP show about a year ago who is white and raising black adopted children, Rachel Garlinghouse. I love her book Come Rain or Come Shine: A White Parent's Guide to Adopting and Parenting Black Children. You can also visit her website and follow her on Twitter. Rachel is lovely and insightful and may be of help as you navigate this process. Finally, although I am not adopted, I do have a white mother and she was very proactive in how she parented me racially. She ensured that we lived in integrated neighborhoods, that I attended integrated schools and that I had babysitters and care providers who share my racial identity. I presume CJ will feel loved in your family, but I suspect it's also important to ensure he's not the only child of color in his school, neighborhood and house of worship. Blacky Boo Boo: Do you associate more as a person of color or as a woman? We both know you'll say "I am a woman of color," but I am honestly curious. I have been to boarding school and no matter how many barriers I break, I will always be reminded of my color. But you are a warrior of two struggles, and I wonder which one consumes you more. Perhaps the fact that you are actually a women of color means these two struggles are inseparable, but your experience is a bit different than Erin Gloria Ryan's, say, and I want to know if you even bother to differentiate the two and, if so, how. Sorry for the one million part question. Love you to death, and I hope for your continued success. MHP: My experience of my racial and gender identity are so intertwined they are not separable. I have never been nor felt myself to be anything other than a black girl and then a black woman. Even the identity of "multiracial" is foreign to me. I know many others identify me as such, but I grew up in the South in the 1970s. Multiracial or biracial wasn't a meaningful category. I fully respect the rights of others to self-identify in this way, but I've always been black and never sought to be other than black. Similarly I've never experienced myself as other than a woman. For transgender individuals there is a time in their lives when the world sees them as male or female when they know themselves to have a different gender identity. Janet Mock's new autobiography is a brilliant and accessible introduction to one transgender woman's experience for those who are just learning more about trans identity. Finally, I've also experienced myself as heterosexual. Again, for many queer youth there are periods of questioning their identity as adolescents as they come to full understand themselves as gay. But the world tends to presume heterosexuality and therefore ease that youthful transition to adult sexual identity for those of us who are straight. This is a long way of saying, I don't choose one identity over another. I wouldn't even know how! I am a cis straight black girl. My blackness is experienced through my womanhood. My experiences of racism are gendered. My experiences of sexism are race-ed. But more important than the struggles are the ordinary aspects of life. I don't know how to be a black son, because I am a black daughter. I've never dated a woman, so my experience of romance is always about loving and wanting black men. I've never been a father, but I am black mother. I dance and sing and write and work and play and make love and vote and travel and teach and laugh and cry as a black woman. There is no taking me apart into pieces. Madeline Ostdick: Dear Dr. Harris-Perry, I was so inspired by the Hip-Hop and Feminism syllabus you posted in conjunction with your course at Tulane (and jealous I couldn't be privy to the class discussions). What inspired you to create this course— and how did your students shape the discourse? MHP: I was part of organizing the first Feminism and Hip-Hop conference at the University of Chicago and led a group of high school students in a feminism and hip hop special project at Kenwood Academy in Chicago a decade ago. I wanted to revisit the topic because in 2013 hip hop turned 40 and so did I! I remain interested in how hip hop is a tool for investigating social inequality even as it reproduces many race, gender and class biases. In the Fall 2013 semester, I taught the Hip-Hop and Feminism class that you mention in your question. In December, as part of the Anna Julia Cooper Project that I direct, I hosted the two-day Gender, Sexuality and Hip-Hop conference in New Orleans. The conference brought together a group of scholars, students, artists, and activists for an intensive series of discussions focused on the contemporary challenges and opportunities at the intersection of gender, sexuality and hip hop. We had an impressive group of presenters and performers who came, shared their research and expertise, and were deeply engaged in thinking through the topics of the conference. The conference was the last event of the semester for my students. As part of the class, they had skyped with leading hip hop academics and visited with local hip hop artists. The conference provided an opportunity for them to engage with the same questions we thought through each week about hip hop and identity on a national scale, with scholars, performers and activists from across the country. At that time, the students were all working on completing their independent research papers about hip-hop, gender and sexuality, using data from Cathy Cohen's Black Youth Project survey and the Outlook on Life and Political Engagement survey from Belinda Robnett and Katherine Tate at UC Irvine. During the conference they were able to ask questions about the topics they were writing on, and see multiple examples of original research asking similar types of questions. My students also played a critical role in making sure the conference happened! They helped check in our conference attendees, provide assistance to our presenters, and a whole number of additional tasks that ensured the conference ran smoothly. One of them was even a featured performer. luna-noire: Dear Professor Harris-Perry, Thank you so much for your discussion/debate with Gloria Steinem. Though I read Ms. as a kid and went to a women's college, certain aspects of second wave, non-intersectional feminism always felt off to me as an African-American. Thanks for showing people on a weekly basis that braids and twists are professional. Do you think it is likely, or even possible, for paid maternity and paternity leave to become part of the national discourse and a talking point in the 2016 election? If not, what do you think it will take for the USA to join other nations in this regard? MHP: One of my colleagues, Craig Melvin, recently discussed the importance of paternity leave on his show. To answer your question I'm going to direct you to that segment. Want more MHP, check out her Nerdland Challenge.